Unlike other Telugu typing tutors, the lessons in the Kinige typing tutor are cleverly designed to introduce the key positions—instead of alphabets. Unicode 6.0 has standardized code points for Telugu characters. However, the classic or old characters cannot easily be typed. So, C-DAC has come up with proposal called Enhanced InScript Keyboard Layout. (You can get their proposal from their web site.) I implemented their proposal for Telugu in the name of InScript+. For more details about those old characters, please see this post in my Telugu blog. I get many hits to this blog in the form searches about Telugu keyboard layout. It seems that my earlier posts offering a way to type Unicode Telugu using apple and modular keyboard layouts are attracting many hits. I just want to note here that those two layouts are intended only for people who already knew those layouts (on Anu Script Manager or other proprietary and traditional Telugu typing systems) and do not want to learn a new layout when they want to type in Unicode. If you are new to Telugu typing and want to learn a keyboard layout, you should learn InScript layout. InScript layout is standardized by Government of India for all Indic scripts. Windows XP, Vista, 7 operating systems already come with this keyboard layout. You just need to enable it. InScript layout is also available in Linux and Macintosh operating systems. Here are the normal and shifted snapshots of Telugu InScript keyboard layout. 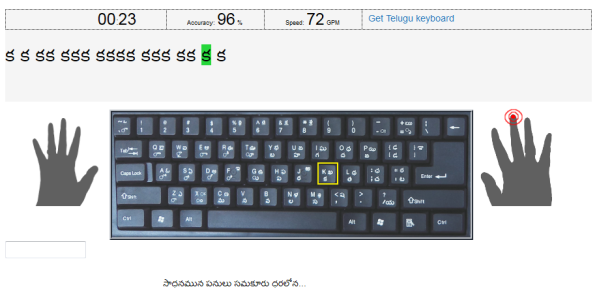 Lekhini now supports typing Telugu using Inscript keyboard layout. To try it go here: Lekhini Inscirpt. Lekhini Inscript can be used to learn (or practice) Telugu INSCRIPT keyboard layout. For more details see the post about Inscript Lekhini in my Telugu blog. By the way, INSCRIPT layout is known as DOE layout in Anu Script Manager.